Greatest Hockey Legends.com: Is Chris Pronger A Top 10 Defenseman Of All Time? Top 20? Is Chris Pronger A Top 10 Defenseman Of All Time? Top 20? Chris Pronger's resume is impressive. But is it impressive enough to have him ranked as one of the top ten defensemen of all time? 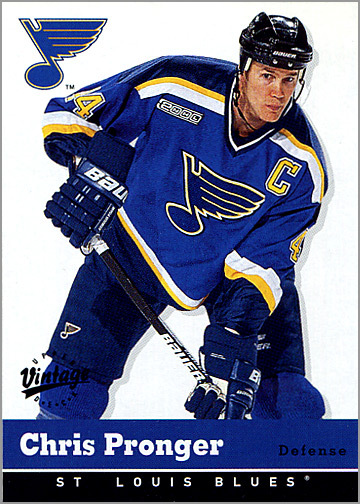 Pronger's physical prowess allowed him to play seemingly half the game. He was a mainstay on both the power play and penalty kill units, and often double shifted at regular strength. Not only was he a game breaking defenseman but he was arguably the top shutdown defenseman of his era. He always played against the top forwards every night. None of his near 28 minutes a night were easy. The most amazing thing about Chris Pronger, in my estimation, was his ability to control the pace of the game. Late in his career he was criticized for being too slow or too old. It did not really matter, as he could read the ice and the flow of the game as well as anyone in the modern era. He seemingly slowed everything down and then when he lulled everyone to his desired level he'd shoot a bolt of lightning into the game, often in the form of a dagger-like pass for a quick break. Old timers tell me the only player that they saw control the pace of the game so well was the great Doug Harvey. Of course Pronger had ability to bring hell, fire and brimstone to any game, too, thanks to his physical game. Pronger was one of hockey's all time great villains. Yes he was big (6'6", 220lbs) but he was down right mean. And he could be dirty. Bottom line - he was intimidating, and unpredictable. "You might spear a guy in the face, fight a guy, elbow a guy, slash a guy or just make a clean bodycheck... If they don't know what I'm going to do, I hold the trump card," he once said. Pronger's offensive game is almost underrated compared to the rest of his game. Too many reduce his offensive to his truly booming slap shot. He had as great a breakout pass as anyone in the game. No, he didn't rush the puck too often or jump into the rush on fast breaks, but he was very much a force to be reckoned with. One strike against Pronger's potential top ten status will always be the popular vote. Pronger has a lot of haters because of his style of play. He definitely ranks as one of hockey's all time great villains, but to an objective observer his villainous swagger would not hurt his ranking, and may even help it. So is Chris Pronger one of the top ten defenseman in hockey history? Let's identify the candidates and see where Pronger ranks. My ranking is hardly scientific, though I do put more emphasis on "legacy" in these rankings than some people. I consider it to be a generational equalizer. It's pretty hard to compare Shore and Clancy and even Harvey and Kelly to the modern day defensemen, but their career legacies are too important to ignore. I would rank Pronger in a group of remarkably similar defensemen who all deserve consideration for the tenth spot: Chris Pronger, Larry Robinson, Scott Stevens, Chris Chelios, Tim Horton, Serge Savard, Viacheslav Fetisov. We could all name no shortage of other candidates, but I'm going to just focus on these seven for now. My initial reaction is to give the edge to Larry Robinson and Viacheslav Fetisov. I'd probably rank Pronger right there with Stevens and Chelios. Wow! How do you choose between those three? Pronger's playoff performances might give him the edge, but realistically there is not much to choose between these three. It certainly seems plausible that Chris Pronger is a top 20 defenseman of all time. He may fall to the 20-30 range on a number of lists because of his villainous ways. But objective observers have to give Pronger his due. Realistically, yes Chris Pronger is a top 20 defenseman in NHL history. I would think a ranking anywhere between 15 and 25 is very reasonable.